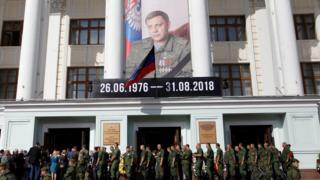 Tens of thousands of people have gathered in eastern Ukraine to mourn a Russian-backed separatist leader who was killed in a bomb attack on Friday. Alexander Zakharchenko, 42, died in the explosion at a cafe in the rebel stronghold of Donetsk. He is the most senior Russian-backed fatality of the conflict so far. Russia's foreign ministry said it suspected Ukraine of organising the latest killing, although the Ukrainian government has denied any involvement. Large crowds have waited in line to pay their respects to the head of the self-proclaimed Donetsk People's Republic, who was killed along with his bodyguard in Friday's attack. Twelve other people were injured. Zakharchenko had been wounded twice in combat, and survived a car bomb blast in August 2014. On Saturday, Russia's Foreign Minister Sergei Lavrov said that international talks on Ukraine could no longer be considered following Zakharchenko's death. The talks, involving leaders from Russia, Ukraine, France and Germany, are known as the Normandy format. They were established to seek a settlement to the conflict in eastern Ukraine, which began when rebels seized large swathes of territory in the region in an uprising in April 2014. Since then, thousands of people have died in fighting between the rebels and Ukrainian government forces. Moscow denies sending regular troops and heavy weapons to the separatists, but admits that Russian "volunteers" are helping the rebels.